The Digital Metrics Field Guide: The Definitive Reference for Brands using the Web, Social Media, Mobile Media, or Email, written by Stephen D. Rappaport and published by the Advertising Research Foundation, does just that. This unique, comprehensive resource was intended for those of us who use metrics and need straightforward, authoritative, non-technical guidance. Available from Amazon, Barnes & Noble, and Independent Booksellers in the US and around the world. Stephen is a sought after keynote speaker, panel moderator, business school lecturer, and workshop leader for such organizations and brands as: the Advertising Research Foundation Conferences, World Federation of Advertisers, Japan Advertising Association, Travel and Tourism Research Association, American Association of Wine Economists, The Wharton School, Columbia Business School, New York University, Johnson & Johnson, Capital One, Ford Motor Company and many other brands. Click here to contact Stephen regarding your talk or workshop. I heard about the Digital Metrics Field Guide on the 6 Pixels podcast. 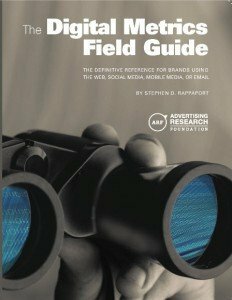 I went to the Advertising Research Foundation website and I can’t find any info on where or how to order. The guide sounds fantastic. I’d love to get my hands on it – for myself and for my team. Can you provide any additional information on availability? Thanks for your help. The Field Guide is available from Amazon, Barnes & Noble, and Independent Booksellers in the US and around the world. See the link above for links.